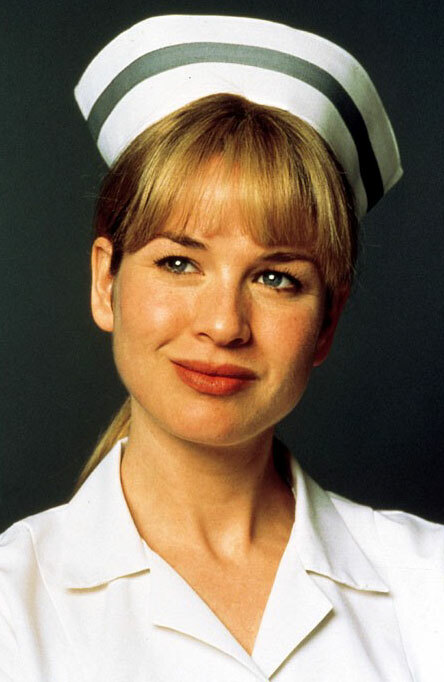 I’d become so used to seeing Renée Zellweger in cosy romantic comedies, it was a little jarring to see her facing off against gun-wielding maniacs in Nurse Betty (2000)… even if she did so in a typically adorable and upbeat fashion. For those who don’t know, this black-ish comedy stars Zellweger as ‘Betty Sizemore’, a sweet-natured Kansas waitress who is thrown into a delusional fugue state after witnessing the mutilation and murder of her cheating slimeball husband, ‘Del’ (Aaron Eckhart). In Betty’s bruised brain, she believes she’s dumped the still-living Del, so that she can travel cross-country and reconnect with an old flame, the exceedingly handsome and heroic Dr. David Ravell… the slight flaw in this plan being that Ravell is a fictional character in Betty’s favourite soap opera, A Reason to Love, played by a C-list actor named ‘George McCord’ (Greg Kinnear). Oh, and the other, rather more major flaw being that the two bickering hitmen who snuffed her husband (Morgan Freeman and Chris Rock), are on her tail and looking to lie up loose ends! I don’t want to give too many plot details away, because one of the film’s major assets is its unpredictability, as it dances gracefully between genres and tones, without ever easing up on the laughs. Zellweger won a Golden Globe for her performance here, and she really does some incredible work, effortlessly winning you over to Betty’s cause, even when you know that the “happy ending” she’s chasing is impossible. Personally, I would have given her an award for those cheekbones, if nothing else! She’s also backed up by some great supporting players, including Tia Texada, as a Latina legal secretary who helps Betty track down her Prince Charming, and Allison Janney as the bemused producer of A Reason to Love. My fave feature on the DVD is a collection of lengthy clips from the fictional soap, which give us more time to appreciate the intentionally-cheesy-emoting of Elizabeth Mitchell, playing an actress who shares several melodramatic scenes with David, and a (very tame) “lesbian” lip-lock with Sung Hi Lee. Meanwhile, Sheila Kelley only had two scenes as Del’s callous mistress/secretary, but she made a strong impression all the same. Fun fact: Janney, Mitchell, Lee and Kelley have all appeared on Lost, at one time or another! Oh, and on the (slightly) more manly side of things, it was fun to see Crispin Glover playing a confident do-gooder for a change… I’m not sure he’ll ever be able to pass for the “Boy Next Door”, but he gives a good account of himself here as the crusading small-town journalist who leaps into action after Betty’s sudden disappearance. This entry was posted in Rants about Films and tagged Allison Janney, Elizabeth Mitchell, Nurse Betty, Renée Zellweger, Sheila Kelley, Sung Hi Lee, Tia Texada. Bookmark the permalink.